The following article is a compilation of information from various threads on the Comrades in Arms forum. It isn’t meant to be the definitive text on the subject but simply a resource for WW2 airsofters who want to get it right first time. The guide is specifically for a British Army impression in the European Theatre of Operation. If you want to be an 8th Army soldier in North Africa you’ll want Khaki Drill (KD). If it’s a Chindit in the Burmese jungle you’ll want Jungle Greens (JG). Those uniforms aren’t covered here. The details listed are also limited to “other ranks” (ORs) rather than officers. 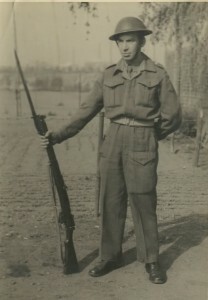 The infantryman of 1939 wore woollen Service Dress (SD) similar to soldiers of the First World War. However throughout the 1930s the War Office had been developing a functional new uniform for its modern, mechanised army. 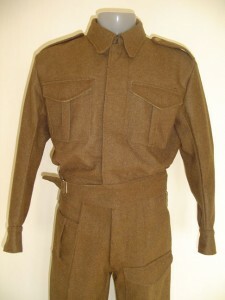 In 1937 the final design was approved for production and although it wasn’t issued to soldiers before 1940, it is known as ’37 Pattern or P37 battledress. It has pleated front pockets, concealed buttons and could be fastened up to the neck. ’37 pattern trousers have a single pocket on the front of the left thigh. Buttons attach the jacket to the trousers. In combat, a collarless wool shirt was worn under the BD blouse. In 1940 the “austerity” ’40 Pattern (P40) battledress was developed. With flat pockets and exposed buttons, this version required less material and less tailoring and so could be produced more quickly and cheaply than its predecessor. The cost of WW2 style repro battledress can come as something of a shock, especially if you chose this impression because you thought it would be the cheaper option. For those on a tighter budget there are alternatives in the form of post war British, Greek, Australian or Canadian BD. The upside is that these second hand and surplus items are made from heavy duty wool and are ideal for battling in. With a bit of hunting around you can get some real bargains depending on what size you are. The downside is that these cheaper options are all different in some way from ’37 and ’40 pattern battledress. British ’49 pattern BD are a different cut and can’t be buttoned up to the neck, Greek BD is the right cut but a very green colour, Aussie BD is both a different cut and a different colour. How much these differences bother you is down to personal preferences. Some aspects can be altered, some can’t. Originally designed as work wear, denim battledress was also sometimes worn in combat in more temperate climates. The cut of ’37 and ’40 pattern denim is effectively the same as ’37 and ’40 pattern wool, although an intermediate ’38 pattern was also produced. cater for the lower budgets. At the time of writing, the Indian company Replicaters has been the subject of so many disgruntled customers that they can no longer be recommended as a reliable supplier. The British Tommy wore black hobnailed leather ankle boots known as ammo boots. At present the only manufacturer of truly authentic ammo boots is William Lennon, a bootmaker www.williamlennon.co.uk who produce boots to the same pattern as the originals they made in the 1940s. Although these boots don’t feature on the company website they can be made to order in your size or bought from the stock of Khaki Devil www.khakidevil.co.uk. 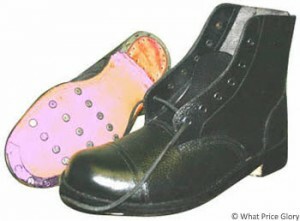 Cheaper, less well made, reproduction boots are also made by What Price Glory www.whatpriceglory.com and sold in the UK by Soldier of Fortune www.sofmiliary.co.uk. For those who don’t want to spend that kind of money, a pair of used DMS boots (Direct Moulded Sole) are the closest to WW2 style uppers and can still be found fairly easily. If you don’t fancy the idea of second hand boots then a pair of army cadet boots are also a good approximation. Avoid the hobnailed parade boots that are often found at surplus stores. Although they look right, these boots have thick, inflexible soles and are useless for anything other than stamping up and down a parade ground. Boots are worn either with wool puttees or canvas anklets. Remember to lace them ladder style and if you want to put a shine on them, limit yourself to the toecaps. This is the easy bit. The British army used canvas ’37 pattern webbing for 47 years from 1938 to 1985. The Indian army used it for even longer. Fortunately there is a huge amount of ’37 pattern webbing around and even original wartime stuff can still be bought very cheaply. The webbing parts are all modular and there are a number of variations in how the kit can be worn. The basic items are belt, two cross straps or yokes, a pair of basic pouches with popper fastenings and a water bottle in a canvas carrier. 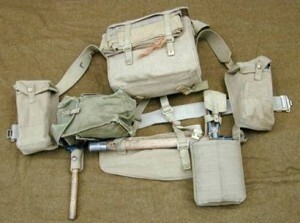 Bayonet, small and large packs and various pouches can all be added depending on the impression. The bible for Brit webbing is www.karkeeweb.com which also reproduces the original guides on how the webbing was to be assembled and worn. The best sources for original webbing items are Sabre Sales www.sabresales.co.uk and Shoot and Scoot www.shootnscoot.co.uk . Repro and original webbing can be bought from Soldier of Fortune www.sofmiliary.co.uk. 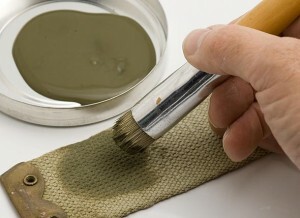 Depending on the theatre of operations, the light tan colour of canvas webbing could be camouflaged by adding a water based dye known by its trade name Blanco, which came in a range of colours. Soldiers would be ordered to blanco the items of webbing that counted as “uniform” – belts, straps, pouches, anklets and packs. Rifle slings and special items of webbing such as sten gun magazine pouches were left raw. As blanco tended to rub off onto clothing, only the outward facing parts of webbing were treated. For a line infantry combat impression the MKII Tommy helmet is an iconic bit of kit. Originally issued in a chocolate brown colour, steel helmets were invariably repainted in the field, usually with whatever paint was being used to camouflage vehicles. Hessian covers and helmet nets that could hold foliage or scrim were also used. 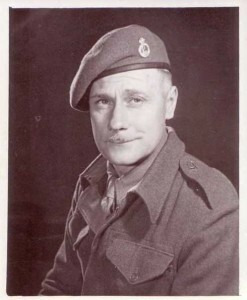 Unlike the American M1 helmet, the helmet liners for British lids weren’t adjustable. Finding an original MKII is pretty easy, finding one that fits not so much. Repro liners can be obtained from Pegasus Militaria and Soldier of Fortune. Depending on your impression, large crown berets, General Service (GS) and Field Service (FS) caps (also known as forage caps) will also be correct. 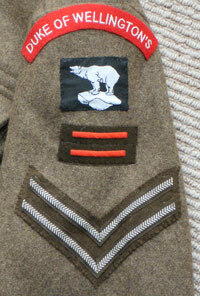 With the introduction of battledress, the War Office intended to do away with divisional insignia and forbade anything except rank to be displayed. The history and pride of individual Regiments was such that these directives began to be ignored and soon the official line changed. The subject of individual divisional insignia is complex and if you want to portray a specific unit it’s well worth spending time researching exactly what that unit wore on its BD. Generally, BD shoulder insignia consists of a shoulder rocker with the name of the Regiment, a patch with the insignia of the Division the Regiment belonged to, Arm of Service stripes that indicated the seniority of the Regiment within the Division and which type of troop the unit was (infantry, engineers, etc.) and finally a patch with the insignia of the Brigade that the Battalion belonged to. Ironically, many commanders ordered insignia removed once their unit was on active service, which makes it somewhat easier for the WW2 airsofter as BD which is devoid of all insignia is not only accurate but also represents the most versatility in portraying different units for different events.